Last week I watched Aziz Ansari’s Madison Square Garden special on Netflix. I anticipated his feminist commentary because of the media coverage it attracted (and I read tons of feminist blogs), but the part that excited me the most was something that, afterward, I couldn’t find much coverage on at all. He lampooned the meat and egg industry. He starts by asking the audience to clap if they don’t eat meat … and then clap if they don’t eat meat because they read books or watched documentaries that turned them off of meat … and then to clap if they don’t eat meat because they saw factory farm footage that fucked up their ability to eat meat. Isn’t that so frustrating? Because no one wants to support that stuff. For the first time in my life, I’m vegan and single. When I went vegan, I was in a long-term relationship with a man who didn’t really understand my transition, but supported it, anyway. It was all I could have asked for. We made it work. He kind of despaired when I moved miso and tofu into his fridge, but he let it happen. And I got him hooked on nooch. Once I asked him if he’d have gone for me if I were vegan when we first met. Not sure if he was joking or not, but he expressed doubt that he would have continued pursuing me if I were vegan right off the bat. Then again, he said he was only gonna give this chick who lived in Mount Vernon one date and end it, but I won him over with my charm. When I first became vegan, the only transition that really occurred to me was the dietary one. Then when people started asking me if that meant I would start to do away with non-vegan clothing and makeup and all the rest, I didn’t really know what to say except that I was in the process of evaluating that issue. So part of my plant-based journey is an effort to more consciously understand what’s in the products I use, even the non-food ones. A big part of that includes my beauty products. For about five years my attention my decision-making on the personal care and beauty product front has focused on finding naturally-based and paraben- and phthalate-free goods. Most of the new cosmetics I use are from Burt’s Bees* and Physicians Formula because of they’re good to my sensitive skin, cruelty-free and they seemed to lack nasty fragrances and irritants. But I was surprised to learn that so-called “natural” and “allergen-free” and even non-animal-tested products aren’t necessarily vegan. Ugh, so much to worry about! What the hell! Now that I have this new consideration to inform my choices, several assumptions have been turned on their head and I still have my budget to worry about. As much as I would love to shop exclusively at Petit Vour and Arbonne and not have to worry about the contents and quality of my products, the reality is that most of my products will come from the drug store. And testing out budget items has meant trying products that are vegan, but contain many of the synthetic ingredients I once eschewed (though my thoughts on parabens have shifted, thanks to posts such as this one). Anyway, come on this cosmetic journey with me as I try to jazz up my amateur makeup routine and find affordable vegan products to love. As with every post on this blog, my efforts are exploratory and educational and aren’t meant to be authoritative. 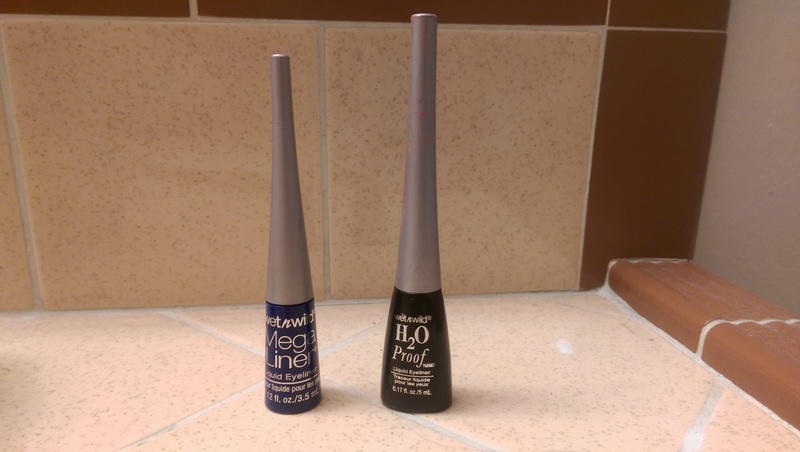 I’ve futzed with liquid eyeliner a bit, namely trying to look schmancy on special occasions with a black line on the lid (possibly a cat eye if I have 15 minutes to kill on eyeliner), but I want to experiment with different colors and brands. A few months ago I purchased two liners from the ultimate budget brand, Wet n Wild. I mean, it’s a cruelty-free brand and I’d heard its quality is improving, so why not check it out? The brand’s website also makes vegan shopping easy with this list, which I kept open on my phone while shopping at a Seattle Bartell Drugs.